I have long been frustrated by the way WordPress handles image uploads. Normally I have to resize an image first, before I upload it, if I want it to span the width of a post. In K2, my current theme, this is 500px. I’ve always wished that I could just upload an image, and have it automatically resize (via GD or ImageMagick) to the right size and dump the original. There are plugins that can do some basic image management, but from tinkering over the last few years they have been rather, well, workflow unfriendly. This post is to test how well the Flexible Upload plugin works, which claims to allow you to set default image and thumbnail size which will be resized at upload, through WordPress’ inline uploader. This is a superb plugin – just what I was after. Get the WordPress plugin Flexible Upload at Ma Tasse de Thé. [Update] The line is back, despite after disappearing temporarily after a reboot. See the photo below. [Update 3: 10th May]A third line, this time magenta, is now flickering on and off 495px in from the left. I’m going to need to get a new display. [Update4: 8th June]I’ve now got 6 lines, cyan, magenta, and yellow. One right down the middle of my screen. 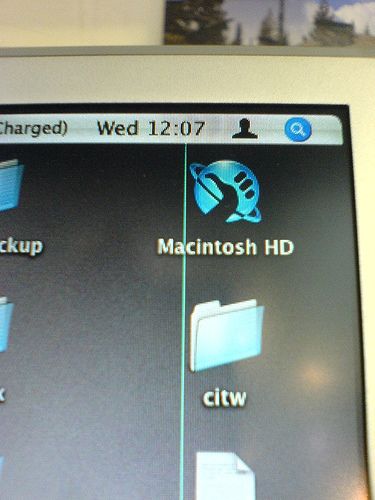 I’ve now found a website dedicated to getting Apple to recognise this defect. My 17″ PowerBook is now 2 years old. It’s been used every day since I’ve had it, and been my workhorse. Even though the new Intel MacBooks are out there I have had no (well, ok, a few) urges to upgrade, until today. Just an hour ago, a vertical cyan line appeared running down the height of the screen on the right hand side. It would flash on and off randomly, as if the row of pixels were stuck. A quick Google revealed that I was not alone. Some afflicted PowerBook owners often reported that once you have had one line appear, you’ll probably get more. There are photos of some rather extreme examples at crosspond.com. I’ve just rebooted, and the line has gone away. Maybe it was a glitch, maybe it’ll return. If it does, I’ll take a photo and submit it to Crosspond’s “Bridget Riley” website. Since I’m in the UK, and if the problem persists, I should be able to get Apple to replace the screen (under the Sale of Goods Act 1979), but I’m not sure. I’ll keep posting about it here, in case others with the same problem pop by. Salisbury District Council are cutting down a load of protected trees and demolishing an 18th century walled garden, locally known as the “Secret Garden”, to make way for a 40,000 square foot glass and steel office block. There has been a protest and an action group, but all to no avail. It’s sad to walk past it each day and see a little more of this lovely place ruined forever. Have you ever visitied Burlington? Didn’t think so. It’s an underground ‘city’ underneath the town of Corsham. The BBC Wiltshire website has a series of videos and panoramas that show off this ex-Cold War complex. The place is huge, containing over 60 miles of roads. It could sustain 4,000 people for up to 3 months in complete isolation. At long last, Flickr users can finally have “sets of sets”! Requests for this feature have been repeatedly been made for at least 2 years, but at last our patience has been rewarded. Flickr call this feature “Collections”. Head over to the Flickr Blog to read the full news. 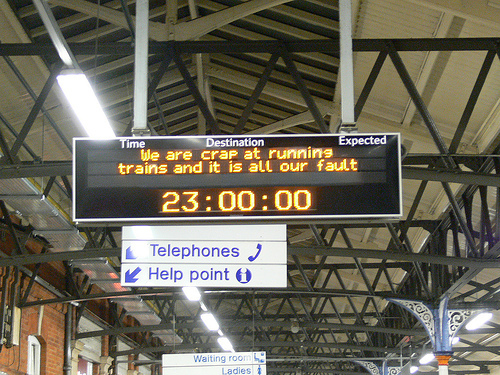 If only train companies were this honest, originally uploaded by T.A.G. Well, it seems that WordPressDash worked as planned with WordPress 2.1.2, so hopefully this should see me posting here more frequently, if this widget (which I had used a long time ago, but had forgotten) is hanging about on my (oft-used) dashboard. Remember that I post archaeology and heritage related information over at Past Thinking in case you’ve found this site expecting that type of content. This blog is for everything else! I should also be able to use tags from this widget, thanks to Ultimate Tag Warrior‘s ability to find embedded tags within the post itself. Well, if you’re reading this, and there are tags listed, it worked..
Sony create a competitor to Second Life? The graphics in this trailer for Sony’s metaverse, named “Home”, are simply stunning. Unfortunately it’s for PlayStation 3 users only, but it certainly raises the bar for purveyors of other virtual worlds. Compare this to Second Life, for example. If you’ve recently upgraded your WordPress install to version 2.1.1 make sure that you upgrade to 2.1.2 immediately. Head over to the official WordPress blog to get the full story.